The beginning of work on the B-36 marked the largest turn in US foreign policy. The prevailing isolationism in the 1930s suggested that the US interests lie mainly within the Western Hemisphere and that the ocean spaces reliably protect America from possible aggression. The second world war that flared up in Europe, the catastrophic fall of France and the most difficult martial law in England made it necessary to reconsider this position. The initial impetus for the creation of this new bomber was the desire to hedge against the defeat of England and the loss of the possibility of basing in Europe. While the progressive development of SAC's surface-launched missile force was both important and highly significant, it was by no means an isolated phenomenon. In most instances, it was paralleled by qualitative improvements to the command's manned bomber force. When the Strategic Air Command was first established on 21 March 1946 as one of the three major combat commands of the United States Army Air Forces, its initial bomber force consisted of 148 veteran World War II B-29 Superfortresses. Two years later, in 1948, this force was augmented with the first models of two new bombers, the B-36 and the B-50. In 1951, the all jet-engine B-47 medium bomber made its first appearance in SAC. This revolutionary aircraft was joined in 1955 by the first B-52 Stratofortress, destined to become the mainstay of the SAC manned bomber force into the 1990s. Further additions to the SAC bomber fleet included the supersonic B-58 Hustler, introduced on 1 August 1960, and the FB-111A medium bomber accepted by SAC on 8 October 1969. The first operational B-1B joined the command on 7 July 1985. The growing maturity and sophistication of the SAC manned bomber force was matched by both qualitative and quantitative improvements to the air defense systems of the leading communist powers, especially the Soviet Union. This latter development over a thirty-year period led to SAC's employment of a number of air-launched guided missiles to ensure that SAC's manned bombers successfully penetrated enemy territory. The bomber's unique strengths of payload, range, and responsiveness coupled with precision attack are a cornerstone of America's airpower and force projection. Prior to hostilities, bombers are a strong deterrent. When generated for either conventional or nuclear alert, bombers provide a strong and highly visible deterrent force just over the horizon from the enemy. During the initial phases of a conflict, bombers launching from the United States with adequate tanker support, can strike time-critical targets and stall the enemy attack anywhere in the world. Delivering a large quantity and vast array of munitions, our bomber force can attack an enemy's Weapons of Mass Destruction (WMD), Command, Control and Communications (C 3 ) nodes, and advancing forces to greatly reduce their effectiveness. The stand-off and stealth penetration capability inherent in the bomber force allows them to operate with minimum numbers of supporting operational assets during this initial phase. Utilizing sustained forward-deployed operations, bombers provide increased firepower while reducing the size of force packages and placing fewer aircrews at risk. Should circumstances require, bombers can also provide rapid global response without the need to deploy into theater before striking. During the Cold War, the primary combat mission of the B-52 and B-1 bombers was long-range, nuclear attack. Their secondary mission was an array of conventional operations that included bombing enemy transportation systems, troop concentrations, airfields, air defense facilities, and other similar targets. Today, the bombers' primary role has changed; the primary mission is worldwide, rapid-response operations. This shift in emphasis has broadened the requirements for bomber aircrew readiness and training. However, secondary missions are still needed. Bombers now have a varied range of mission responsibilities, each involving different targets, weapons, situations, altitudes, and flight profiles. These missions range from supporting maritime operations (e.g., laying mines from the air) to interdiction (e.g., bombing military industries deep in enemy territory). Bomber aircrews must perform all their missions using teamwork to penetrate enemy air defense systems, fly the aircraft into the proper position for releasing ordnance, and maintain the aircraft's geographic position and timing to stay in formation with other aircraft. Difficult decisions must be made in split seconds to determine if a maneuver will move the bomber out of position preventing ordnance release or putting the aircraft within range of enemy missiles or guns. Added challenges include complicated missions occurring at night, under bad weather conditions, or in mountainous terrain. To survive combat, aircrews must conduct training simulating these situations to the greatest degree possible. Not only must aircrews within individual aircraft work together in a closely coordinated manner, they must often function as part of a larger composite force composed of 40 or more different aircraft, each with a specific mission goal. Fundamental bomber combat missions involve a range of activities, including air refueling, high-altitude flight to the combat theater, entry into enemy territory, avoidance of enemy threats, delivering ordnance, and returning safely to base. These activities can occur at a variety of altitudes, depending upon the mission. Despite mission differences, bomber aircrews must always navigate accurately to the combat theater and target(s), avoid or neutralize enemy air defenses, deliver the ordnance on time and on target, and survive. In its simplest terms, combat is about defeating the enemy and preventing harm to U.S. and allied forces. When aircrews enter combat, they risk their lives. To reduce that risk and increase the chance for a successful mission, bomber aircrews need the most realistic training possible. In the Gulf War, bombers performed long-range, low- and high-altitude attacks on communication and industrial facilities in Iraq and later provided support to ground forces by bombing the entrenched Republican Guards. More recently, bomber aircrews from Barksdale and Dyess AFBs flew halfway around the world to launch cruise missiles and other ordnance at facilities for weapons of mass destruction in Iraq. Each time these aircrews entered the Iraqi theater, they needed to be ready for any threat or contingency. A different set of threats faced B-52 and B-1 aircrews recently in Kosovo. This variation in threats underlies the need for flexible realistic training. Bomber combat missions vary day-to-day as enemy locations, targets, air defenses, and objectives change. For one mission, a bomber aircrew could be tasked to perform high-altitude bombing of an enemy's fuel depot; the next mission could involve a low-altitude attack on enemy troop concentrations. Each combat mission involves a number of different aircraft performing a precisely timed and planned sequence of events. Failure by a single aircraft to achieve the necessary timing, coordination, and positioning could jeopardize an entire mission. Each combat mission is unique, so aircrews must be fully trained to accomplish a wide variety of tasks. The types of bomber missions and tactics also vary from time to time as a result of changes in world situations, increases in enemy capabilities, and advances in own aircraft and weapons. Air Force personnel must consistently adapt and train to meet the challenge of these changes. Such changes can influence the altitude at which aircraft fly, the types of ordnance used, the tactics used in attacking targets and avoiding threats, and other aspects of combat missions. Because the Air Force needs to respond to such changes, aspects of aircrew training can vary from year to year. Preparing for these varied missions means that aircrews must have flexibility in training to respond to evolving global situations. Today's force structure is largely a legacy of the Cold War when intercontinental bombers were part of the Nuclear Triad to deter, and if necessary, defeat the former Soviet Union. While part of the bomber force continues to support the nuclear deterrent mission, the environment permits, in fact demands, increased emphasis on conventional missions. The bomber force structure required to prosecute two nearly simultaneous major theater wars and contribute to a nuclear posture that deters aggression has been defined by studies and national guidance. The 1993 Bottom-Up Review (BUR) confirmed today's bomber force structure requirement. Today's sizing of forces was built on the philosophy that the US should maintain sufficient military power to be able to win two nearly simultaneous, major theater wars. The BUR determined the bomber requirement by 1999 to include up to 184 total bombers (combat coded), with the ability to deliver "smart" conventional munitions against attacking enemy forces and fixed targets. To support the imperative of engagement in the National Security Strategy, the DoD laid out a National Military Strategy of Shape, Respond, Prepare Now: A Military Strategy for a New Era. 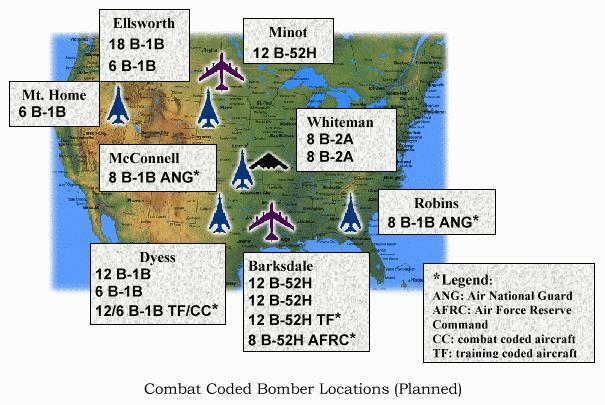 Details of the strategy and resultant defense program in the May 1997 Report of the Quadrennial Defense Review (QDR), prescribe a total fleet of 187 bombers (95 B-1, 21 B-2, and 71 B-52). Since the QDR, two B-1s have been lost in peacetime accidents. However, the Report of the Panel to Review Long-Range Air Power (LRAP) concluded the existing bomber fleet cannot be sustained through the expected life of the air frames and that additional aircraft will eventually be required. To address this issue, the Air Force will add five additional B-52 attrition reserve aircraft, bringing the B-52 total from 71 to 76 for a total bomber force of 190. Early in the next century, the bomber fleet will see the fruition of the plans described by the Air Force's '92 Roadmap, including the transition of the bomber force from a cold war instrument to a flexible response force. Consistent with the LRAP findings and the Defense Science Board's 1998 Summer Study Task Force Report, the Air Force is making significant near through long term investments in integrating precision munitions, enhancing connectivity and mission planning responsiveness, and increasing bomber sortie rates. To this end, the Air Force has already invested $3.6 billion in new combat capabilities and reliability and maintainability upgrades, along with budgeting for $22.6 million in bomber Forward Operation Location (FOL) requirements. The significant conventional modernization effort outlined in the 1992 Bomber Roadmap has produced three large payload, long-range "bomber" platforms now able to conventionally destroy multiple targets per sortie - creating desired effects at the strategic, operational, and tactical levels simultaneously. By 2000 all three bombers will have large payload Joint Direct Attack Munition (JDAM) near-precision delivery capability. The bomber arsenal will also have impressive B-52 stand-off weaponry and Joint Stand-Off Weapon (JSOW) capability on-board the B-2. These enhancements have merged precision, stealth, and stand-off with the payload, range and responsiveness of the bomber arsenal. Bombers are now a critical element of a joint conventional aerospace team with unique capabilities to fulfill Commander-in-Chief (CINC) requirements across the full spectrum of conflict. Prior to 2002 DOD studies assumed that the USAF bomber fleet would remain constant at 208 Total Aircraft Inventory (TAI) (94 B-52H; 93 B-1; 21 B-2), and cited the economic loss from premature retirement of aircraft to be a significant program risk. However, under the Bush Administration the total force was reduced substantially to 157 aircraft (76 B-52H, 60 B-1; 21 B-2). The total operational fleet for combat tasking was reduced from 130 to 96. The B-52H continued to accomplish its assigned missions remarkably well. Although the number of available Primary Assigned Aircraft (PAA) bombers is extremely low, the USAF retired more than twice as many B-1s as B-52Hs.